CookDojo Home Edition 1.12 is food & drink software developed by Cookdojo.com. Web based recipe managemet. This software enables you to manage all your recipes with ease. Adding, editing, printing and searching for recipes is simple and fast. You can make your own ebook. Features : Web Based; Add / Remove Recipe Category; Add / Remove Recipe in Category; Search recipe in title, ingredient, method; Export to E-book (format PDF); Make US Index Card 4x6 and 5x8 (format PDF); Printer Friendly. This home & hobby program is freeware, so you can download and use it absolutely free. 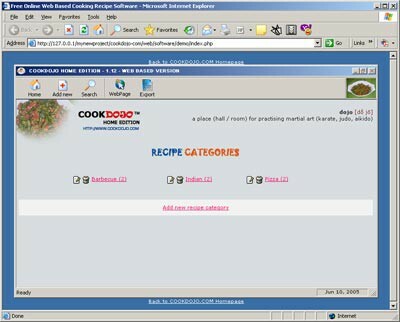 CookDojo Home Edition 1.12 supports English interface languages and works with Windows 98/XP/Vista. Latest CookDojo Home Edition 1.12 does not contain any spyware and/or advertise modules, allowing installing it with no worries concerning valuable information loss. Our website has thoroughly tested home & hobby product CookDojo Home Edition 1.12, written the review and uploaded installation file (164K) to our fast server. Downloading CookDojo Home Edition 1.12 will take several seconds if you use fast ADSL connection. Gene's Recipe Cards is an easy to use cooking aid for organizing recipes. A Cook's Books is recipe management software designed to make storing, editing, and finding recipes a snap.